Don't leave your lunch behind - let your favorite ponies from My Little Pony: Friendship is Magic help you carry it around! This My Little Pony Friendship is Magic Insulated Shopper Tote is reusable and lightweight, plus, it's insulated to keep contents cool! 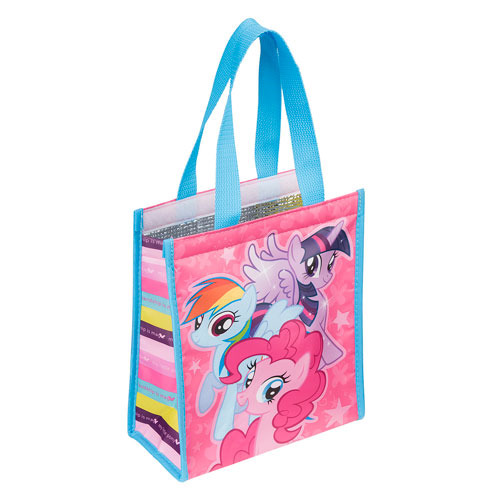 This great bag features fun images of Pinkie Pie, Applejack, Fluttershy, Rarity, Rainbow Dash, and Twilight Sparkle! Made from 25% recycled materials and wipes clean with a damp cloth. Measures 10-inches tall x 9-inches long x 4 1/4-inches wide. Ages 13 and up. Made from polypropylene.